This painting (like the similar Still life with a chair and basket of eggs [q.v.]) seems to illustrate one aspect of the two very diverse styles which informed Verdoodt’s work. It appears, at first glance, to epitomize the realistic: perfectly rendered, accurate images of very mundane articles. The chairs in both paintings recall Van Gogh’s painting of the yellow chair in his bedroom, whilst the collection of objects on the chair seats are reminiscent of 17th century Spanish still life paintings. 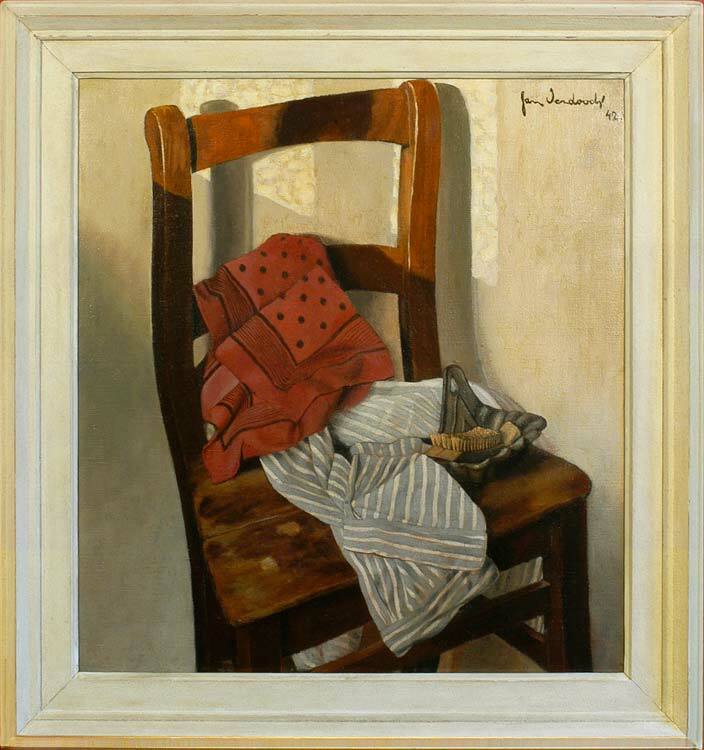 However, the tilted viewpoint, with its slightly strange perspective, and the hyper-realistic treatment of the towels and shirt, are at the same time very clearly the work of the Surrealist Verdoodt, who produced Dali-like arrangements of objects in outdoor settings and other-worldly landscapes. These are still life paintings with an intellectual and symbolic sub-text, which will grow richer with continued study.